Using the British National Grid, EarthSense has divided the UK into 100m (328ft) squares – about twice the size of an average soccer field. Air pollution readings from satellites and its own Zephyr air quality monitoring sensors were combined with open data, including traffic emissions and weather conditions, to produce an annual average for each cell. The MappAir data is available to view and purchase online at www.blueskymapshop.com. 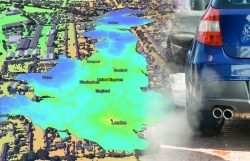 As additional sensors come online and more historical data is made available, EarthSense plans to produce a range of MappAir products, including an ultra-high resolution 1m (3.2ft) data set for detailed study areas; a 10m (32.8ft) map for urban areas; time-lapse maps showing how air pollution changes over the course of a day and on different days; and forecast maps giving an indication of fluctuations up to three days ahead. EarthSense also plans to release a map of PM2.5 (ultrafine pollution particles smaller than 2.5 micrometers). MappAir products are designed for a wide range of applications including local planning, enforcement and mitigation strategies, as well as commercial applications such as conveyancing and health diagnostics. It is hoped the MappAir products will also help with public engagement and behavioral change initiatives.